The HIP conference takes place in Stockholm, Sweden, from 9–13 June 2014. 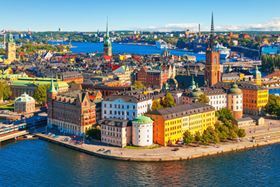 This triennial conference, which takes place in Stockholm, Sweden, from 9–13 June 2014, will feature speakers from Total, GE Oil & Gas, Areva, Rolls-Royce, SNECMA, Aerojet Rocketdyne, Aker Solutions and IHI Corp. The conference will cover topics such as material development, production of near net shape (NNS) components, part design and process modelling. Aspects related to powder metallurgy processing, diffusion bonding and part densification will also be included. The full programme and registration form can be found here. We spoke to Jonathan Wroe, executive director of the EPMA, about his view of the industry and what could happen over the next ten years. Liz Nickels spoke to Quintus’ Peter Henning about what's hot in the world of HIP. Heat treatment company Quintus Technologies has reportedly supplied a HIP to Portland, OR, USA-based Stack Metallurgical Group.